Avery Elle is having their first challenge! Lately I find myself seeing these fun challenges and I just can't help wanting to be part of it! Recently I just got the cute Simon Says Stencil (Rainbow) and wanted to give it a whirl. I have a NEW feature coming up next in this blog! You definitely don't want to miss the fun! This is my 2nd post for today. 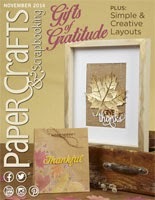 For my Paper Crafter's Library guest design work, please visit here. Hello! I am popping in to share my last minute entry for Paper Smooches SPARKS Challenge! I used this as a sketch and created a colorful card. First, I created a colorful water-colored background on paper. Then I stamped, masked and paper-pieced the pieces and added to the canvas and brushes. The bottom piece of colored paper is from American Crafts. It matches my colors perfectly! Lastly, I added the orange ribbons (remember them?) from May Arts. Lastly, I am deeply deeply touched by your unfailing support about voting for Stand up to Stigma and so is Stephanie! Here is their campaign video that they produced in Oct. 2012. Stephanie was the mastermind for this video as she was the photographer, director and she also came up with the idea of using chalkboard! Reminder: A note about my daughter Stephanie's Mental Health Campaign "Stand Up To Stigma" that she co-founded with her friend Kristin, thank you SO much for your diligent voting. We are aware that the votes are quite behind. However, there is a GREAT chance that her team can still win the Top 3 ( not by voting, but chosen as a TOP 3 FINALIST by a panel of judges selected by the Council of Ontario Universities). This means that her team will still have a chance to be awarded at least $500 (and possibly more) for their campaign! You are encouraged to continue to vote for the PEOPLE'S CHOICE AWARD on this site (click "Kristin Brown" in #2 on the list). 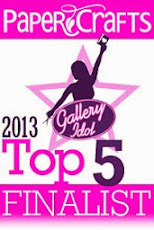 You can vote once every 24 hours til March 3! now and check it out! Thanks for stopping by! Create a "Faux" Wood Veneer! Hello! I am popping in to share a little fun card that I made. I didn't have any rules as far as the design goes. I made this card in response to the CARDS challenge (see here). The challenge is calling for wood veneer. I thought I had some wood veneer in my stash since they are quite popular...but to my dismay, I had NONE! How could I let this happen...? I am not sure if that resembles a wood veneer. But I think I like it...so much that I created a water-colored background to go with the butterfly. Here is the final result. Again, I am taking my own "Hot Mess" approach and created a water-color background (also with the stamp set from Background Check and Distress Inks). I added the embossed sentiment on vellum from Neat & Tangled. To keep the design in balance, I added some hand-stitching on the right hand top corner. It was super relaxing and fun to make this card! I totally enjoyed it! 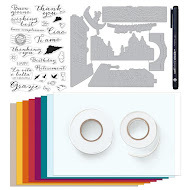 And by the way, if you like that Background Check Stamps from Fresh Squeezed Stamps, it's TIME to buy it as they are closing the shop (Wahhhh...me sad) and all stamp sets that are in stock are 30% off! Reminder: A note about my daughter Stephanie's Mental Health Campaign "Stand Up To Stigma" that she co-founded with her friend Kristin, thank you SO much for your diligent voting. We are aware that the votes are quite behind. However, there is a chance that her team can still win the Top 3 ( not by voting, but chosen as a TOP 3 FINALIST by a panel of judges selected by the Council of Ontario Universities). This means that her team will still have a chance to be awarded at least $500 (and possibly more) for our campaign! You are encouraged to continue to vote for the PEOPLE'S CHOICE AWARD on this site (click "Kristin Brown" in #2 on the list). You can vote once every 24 hours til March 3! Flowers with a tiny bit of Quilling! Hello! 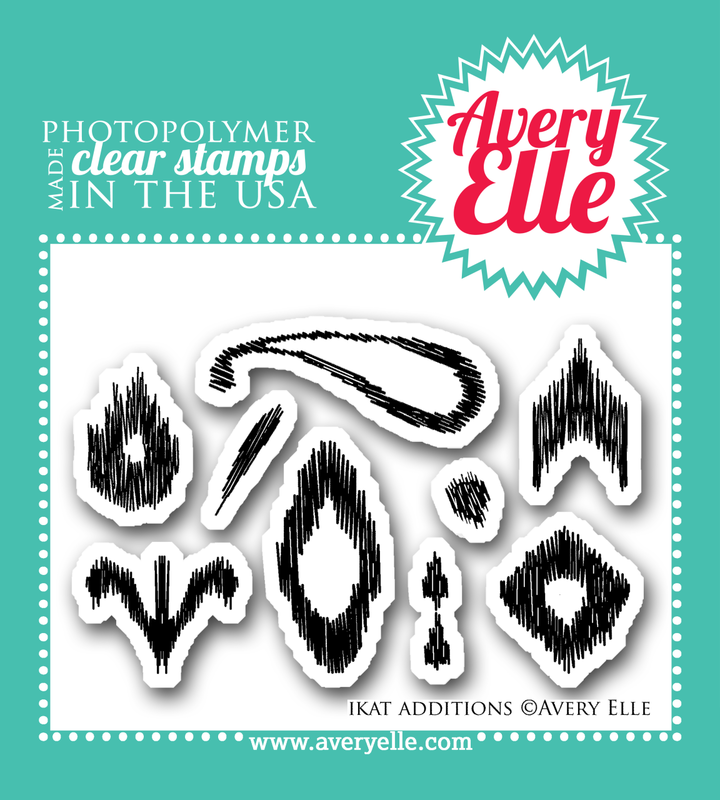 Today I am sharing a card with this stamp set " Ikat Additions"
It's the the only Avery Elle Stamp that I own. Thanks so much, Piali! 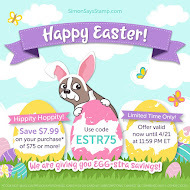 I just ordered some more from Simon Says Stamps...hope the shipment comes soon! Are you longing for spring's arrival? Well, today's card will hopefully bring a bit of Spring to you! I used the Ikat pattern to create flower petals. 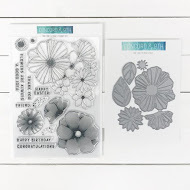 I love the intricate details of this stamp set and how easy it is to create any kind of pattern or background. Here is my previous Christmas card with the same stamp set. For the flower center, I used a bit of quilling (my latest fad). It adds some dimensions and interests. I also created a watercolor background to go with the whimsical-looking flowers. The sentiment is from Simon Says Stamps. I am linking this up to Avery Elle's blog. I have a simple winter card and some fun family photos to share today...here's the card! I did some paper-piecing for the card! It's super easy and fun to do! They say that if you can't beat them, then join them! Well, obviously we can't beat winter, so I did what I could--join the fun and celebrate winter. 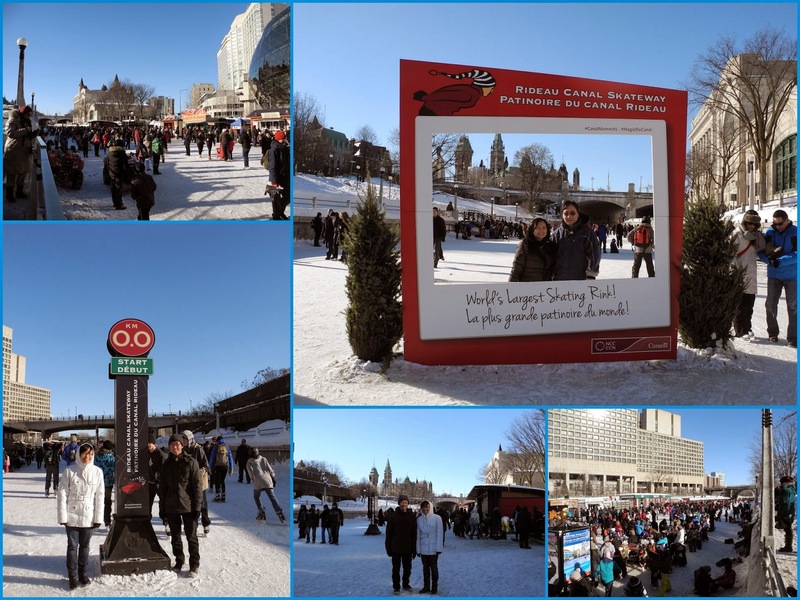 Two weekends ago, we visited my in-laws in Ottawa (nation's capital) and stopped by at the Rideau Canal where the yearly Winterlude takes place. 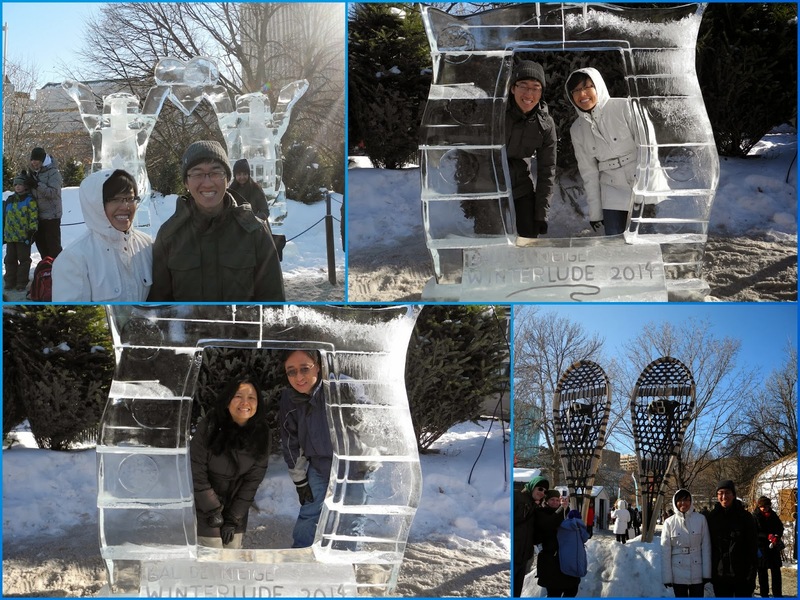 There were some really AWESOME ice sculptures on display. 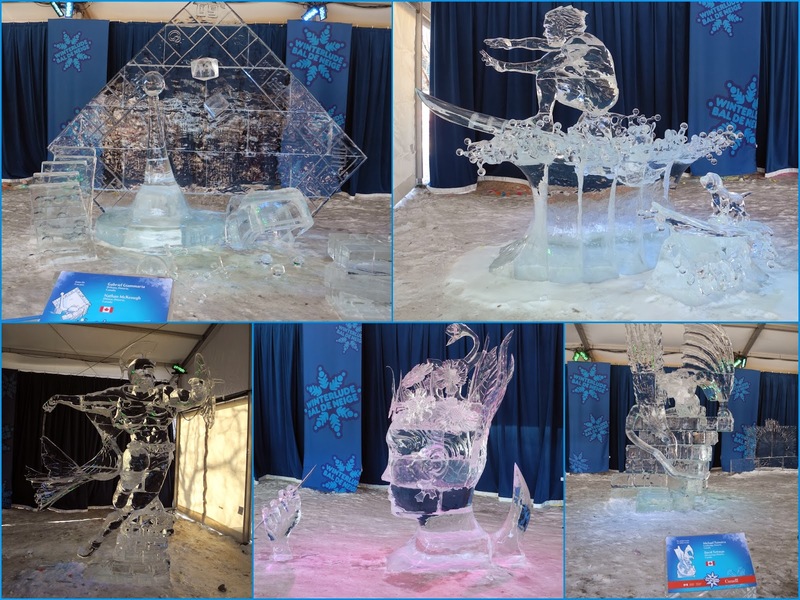 Ice carvers from around the world turned blocks of ice into stunning works of art. At night, coloured lights reveal the magical beauty of the ice sculptures. And of course, what are folks and fun without FOOD? 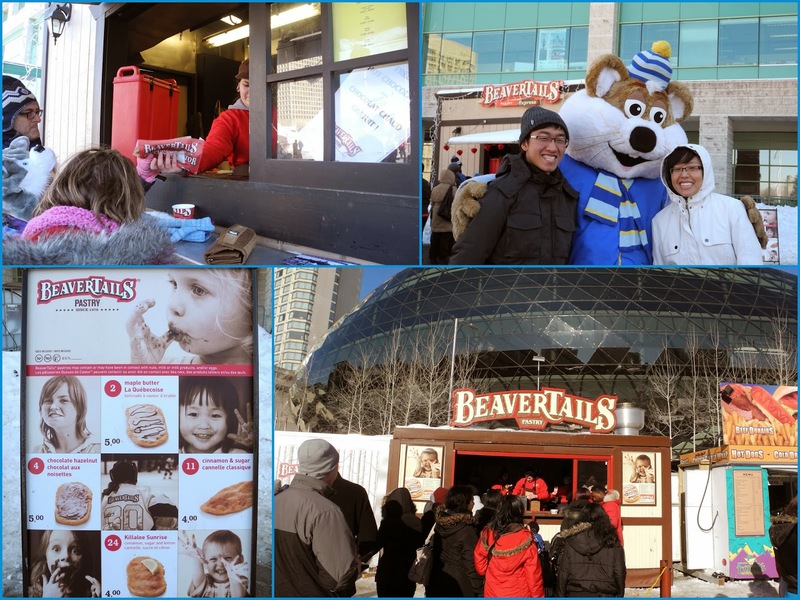 BeaverTails are the Canadian originals! What are BeaverTails, you ask? Basically it's fried dough pastries, individually hand stretched to resemble a beaver's tail. You can get different toppings such as (see bottom left photo) Whipped Cream, Maple Butter, Cinnamon & Sugar and Chocolate Hazelnut. To save calories and $, my big kids posed with the Ice Hog mascot instead! In winter, the historic Rideau Canal becomes the world's largest skating rink. The ice extends 7.8-kilometres and runs through the heart of downtown Ottawa. We spent about an hour and half on the Canal and that was enough for me! Brrrr....As much as I loath the winter, we do have to embrace winter here in Canada. That's what make us "cool" (wink!). Originally from Taiwan, I became a Canadian citizen when I got married to Dr. John (born and bred in Ottawa). When we first wrote to each other in our first winter (me in Taiwan, he was in Canada), he wrote: "I hope you like snow, Virginia, because Canada has lots of it". He did warn me about the snow, didn't he? 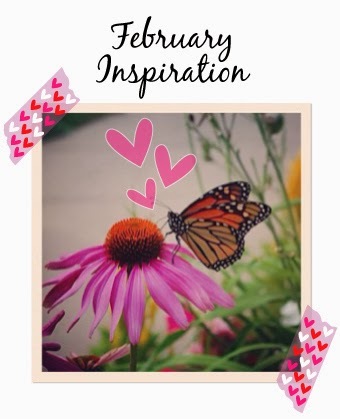 My dear friend Mariana Grigsby is challenging herself and her blog followers with a monthly inspiration. I am joining the fun with Mariana! Please check out her post (details here)! If you have not seen her videos (see here), I highly recommend you to subscribe. Mariana's craftsmanship and detailing are amazing. You can subscribe to her blog here. With this lovely photo, I created a water-colored card. With this card, I first water-colored the background with paint brush and Distress Inks, then I stamped the images after the watercolor paper became dry.I stamped the sentiment in light blue (Corn Flower from Hero Arts) to keep the color scheme light and soft. Hope this brings a touch of Spring to you! Hello, there! How is your day going? I love creating (surprise!!) and I always look for ways to maximize the use of stamps whenever I can. Even though this set of stamps "Love Signs" was meant for Valentine's Day, it can be used for many various occasions throughout the year. 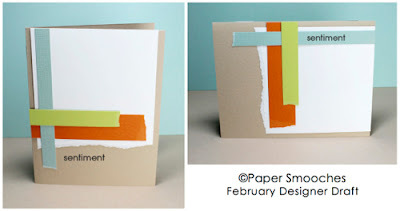 I am sharing a shape shaker card (say that three times fast!!!). With the pattern paper, clear acetate and sequins, button, strings and 3D pop dots....done! 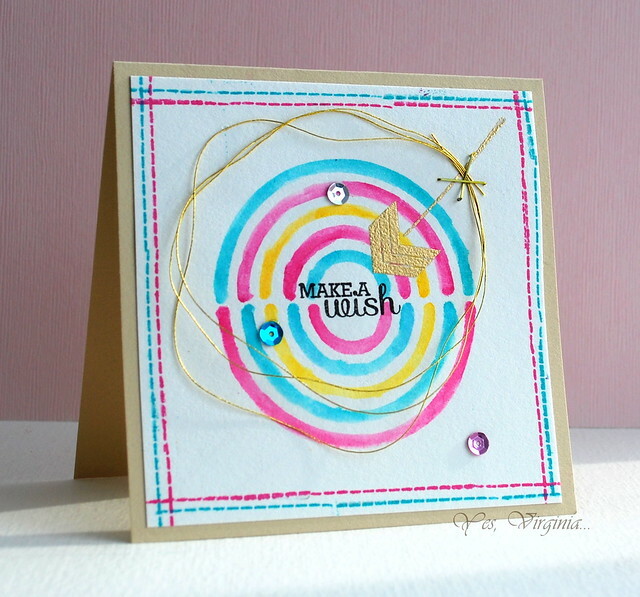 After I made this card, I noticed Moxie Fab World is having a Hooked on Hexagon Challenge! So I am going to link this up and share! I am giving this card to my daughter Stephanie because the sentiment fits her PERFECTLY! Reminder: please take 1 minute to vote for the PEOPLE'S CHOICE AWARD on this site (click "Kristin Brown" in #2 on the list). My daughter Stephanie co-founded this Mental Health Campaign with two classmates from her Master's program back in 2012. You can vote once every 24 hours til March 3! It's currently very behind in 3rd 4th place!!! If you are seeing this for the first time, details are here and here . I know Stephanie and her team really appreciate your BIG help (and so do I!!). 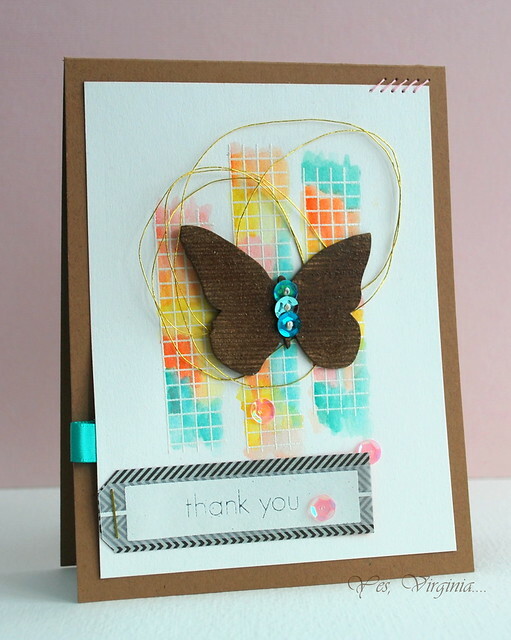 Today's my turn to share a project over CAS-ual Fridays Stamps! I had combined my favorite elements in this card--gold, strings, the 2014 color (Radiant Orchid), paint chips. All stamps are from CAS-ual Fridays Stamps (see here and here). Ding---> to achieve the rich thickness of the embossed hearts, I gold-embossed the hearts twice! Yup, as soon as you emboss the image (still hot), quickly stamp in Versamark and add gold embossing powder! And of course, I had to add some gold strings to complete the mess! I also used my favorite paint chips to make the arrow die cut. Hope you like what you see. This card is perfect for someone special, don't you think? The comment feature in this post has been turned off. 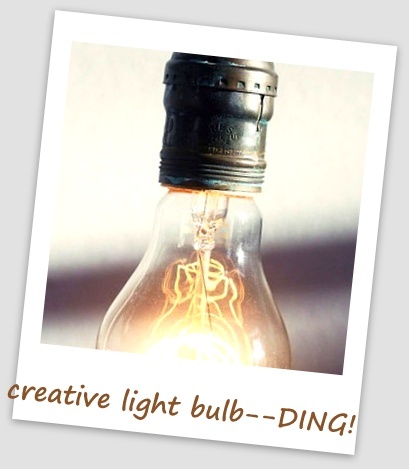 Please leave me some blog love over CAS-ual Fridays! 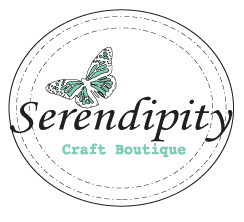 Welcome to Runway Inspired Challenge! How do you like this runway photo? It is modern, chic and with a touch of flirtatiousness..it is FUN! In the end, I think I am pleased with the result. I took my "hot mess" approach and used the stamp set my dear friend Keren Baker gifted me last Christmas. I did some hand-stitching (gasp!!) and made it look like machine -stitched. I think it kind of worked! You might be intrigued what my hot mess approach is...well, basically I assembled a cluster of elements and arranged it in a visually-appealing way. Asymmetrical design can work its magic! Hello! Today is my LAST post for Fresh Squeezed Stamps. It's hard to believe that I started last July and it's time to say good bye to the DT over FSS! It's been an absolute pleasure to with with these fine quality stamps! 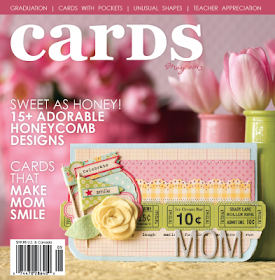 I know Mother's Day is still far away...but this design is great for any type of themes! With the twines and lace ribbons, this card is ever so feminine! 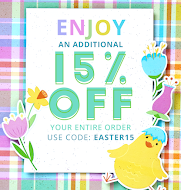 For more details about this card, please visit here! 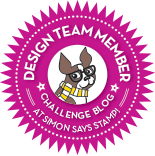 This post concludes my design term with Fresh Squeezed Stamp. I want to thank Ryann and Shannon for giving me this amazing opportunity to work with FSS! It's been a blast! The comment feature in this post has been turned off. 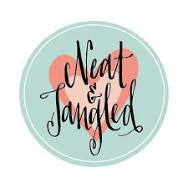 I would love it if you can stop by Fresh Squeezed Stamps and leave me some blog love one last time while I am still on the DT! Reminder: please take 1 minute to vote for the PEOPLE'S CHOICE AWARD on this site (click "Kristin Brown" in #2 on the list). My daughter Stephanie co-founded this Mental Health Campaign with two classmates from her Master's program back in 2012. You can vote once every 24 hours til March 3! It's currently quite behind in 2nd place 3rd place!!! If you are seeing this for the first time, details are here and here . I know Stephanie and her team really appreciate your BIG help (and so do I!!). 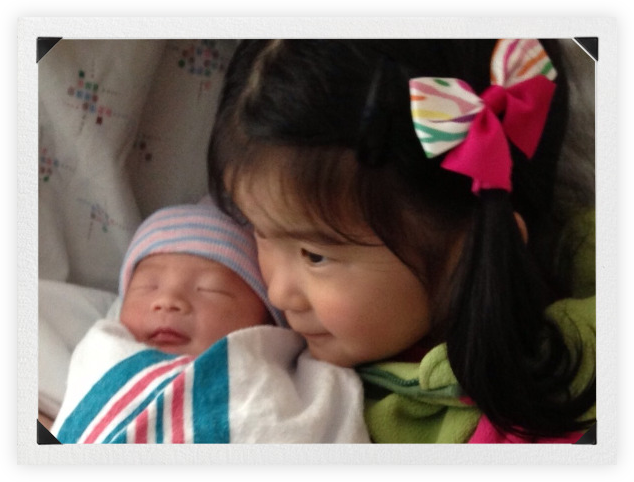 Recently, in our Lu family, we are blessed to welcome another baby into the world on Feb. 4. You may remember my Grandniece Apphia (my nephew Stephen and his lovely wife Grace's daughter)? Apphia made frequent appearances on my scrapbook pages/cards. Here was the recent one. Well, Apphia just became a big sister to her new baby brother Matthias (rhymes with Apphia!)! I used Martha Stewart circle punch to create the "buttons" and used twines to "string up" the buttons. 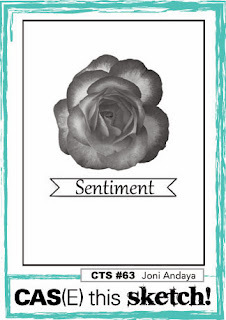 The sentiment and small scallop borders are from SRM Stickers. The stamps are Textures and Shapes (Hero Arts). 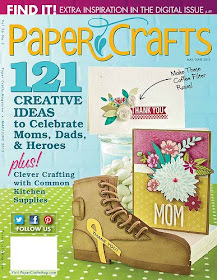 Ding---> Have you used your good old paper punches or spellbinders lately? I bet you can use them to punch out some shapes and use them in your card design. 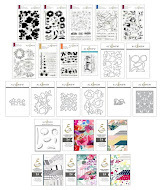 Try oval, squares, diamonds, circles...you will be amazed what you can create! A Food Post and a Valentine's Day Card! I am sharing a Valentine's Day card. It's a simple pocket card. Stamps are from Fresh Squeezed Stamps. I made this a while ago and almost forgot to post...today is the perfect chance! Are you making anything yummy for your love ones? Well, it's been a while since I do a food post. Other than being a full time card-maker, I also run a 24/7 kitchen in my house! 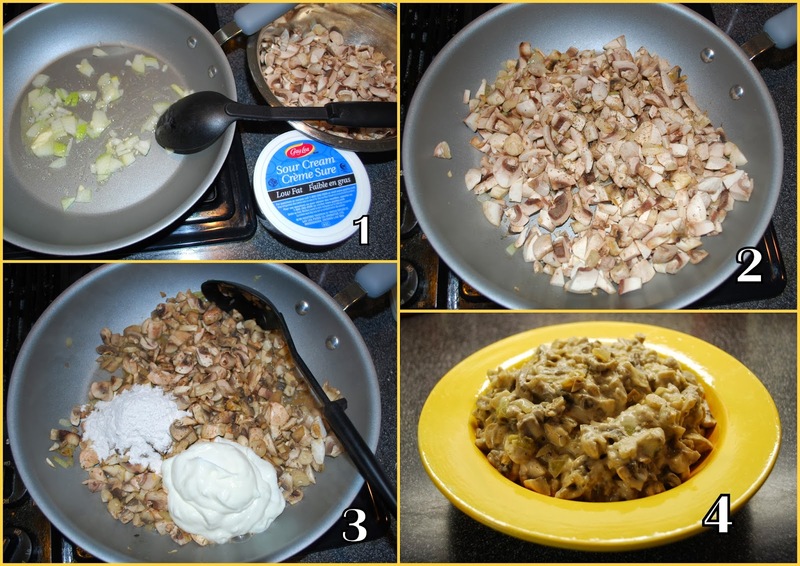 These Mushroom Turnovers have always been an old favorite in my household. I had the recipe for years! 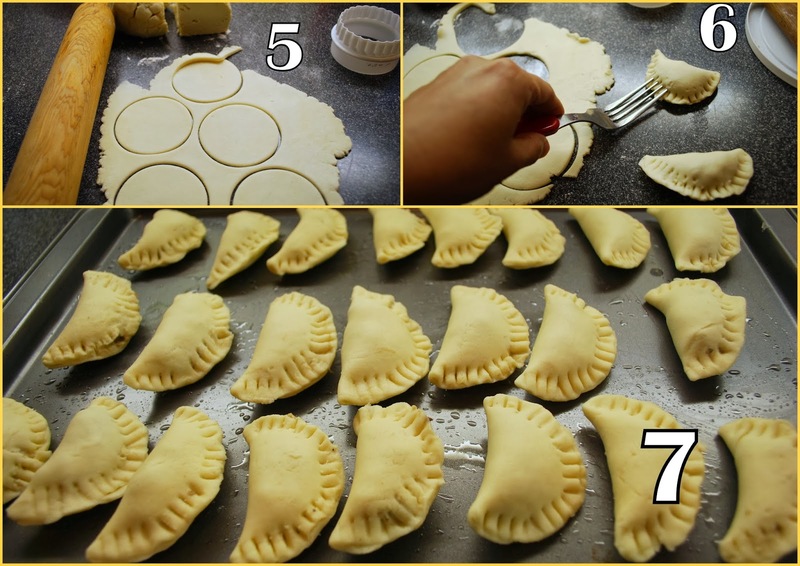 Once in while, I will make it for special occasions...as you can see, it's a bit tedious to make, but when I do make them, I just love it (my tummy loves them even more!)! 7. Brush tops with beaten egg. Bake in 450 F (230 C) for about 10 minute or until golden brown. My Mushroom Turnovers were devoured before I thought of taking the final photo! But you get the idea....they are golden brown and yummy! A crafty blog friend wrote me a while ago and asked me: "What is the best way to determine your style?" Well, sorry to say that I don't have an answer. 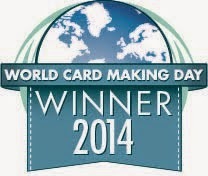 I think the best way is just to keep experimenting and see where your card design takes you.....the sky is the limit! 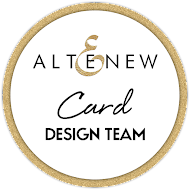 I am more of a simple stamper and tend to make clean and simple type of cards. 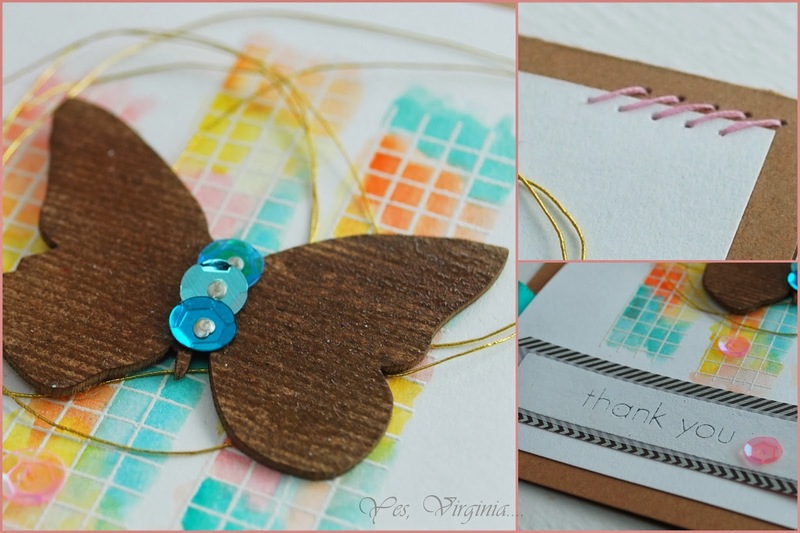 I do admire card makers who can layer beautiful elements and they make it so effortlessly! I think that is something I don't do...a lot. 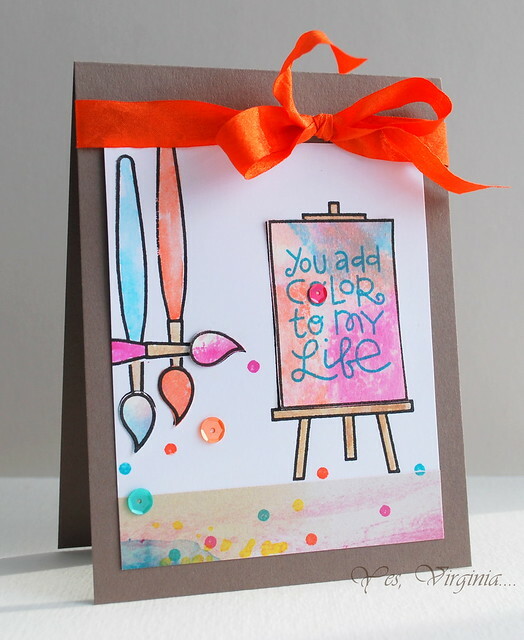 Today I am sharing a card that is different from my norm. I also did something that I have never done before--quilling. The reason? My kids have this Klutz (here they called it "Twirled Paper") book for years and of course, it's been sitting on the shelf! I am not even sure if they played with it. But, never mind! I can now use it! It comes with a nice quilling pen and paper! I am just going to have to perfect quilling! When I looked at the red heart, it is FAR FROM perfect! I think I have a long way to go on quilling. BUT this is something new. I am taking baby steps and having fun experimenting. What style would you like to try and haven't? Food for thought, huh? Reminder: please take 1 minute to vote for the PEOPLE'S CHOICE AWARD on this site (click "Kristin Brown" in #2 on the list). My daughter Stephanie co-founded this Mental Health Campaign with two classmates from her Master's program back in 2012. You can vote once every 24 hours til March 3! If you are seeing this for the first time, details are here and here . I know Stephanie and her team really appreciate your BIG help (and so do I!!). I am doing the last minute dash to play the challenge over CAS(E) this Sketch # 63. 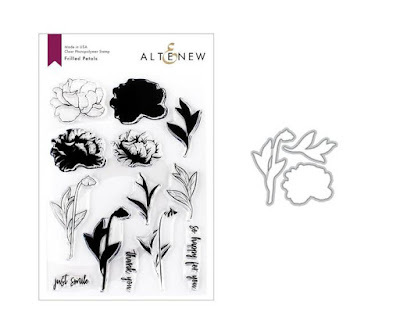 This fun sketch gave me a chance to play with Night Flower stencil again. Hard to believe that the only stamped image is the sentiment (from Simon Says Stamps). For the Night Flower image, I used Emboss Gloss (by Stampendous) which I had for YEARS to do the gold embossing. It is handy to use it over the stencil. Although the gold-embossed image was not perfectly clean and crisp, I think it turned out fine with the TH Distress Inks (Fire Brick, Barn Door) with the Emboss Resist technique. Here is another Sir Elton John video (1:46 minute long, Philadelphia Freedom). 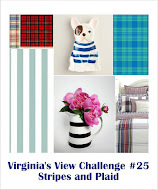 I thank all my US friends/blog followers as I videotaped this one especially for you! Sir Elton John's Video and...a favor! My hands got a bit tired from the video-taping...it was hard to keep my hands steady during the concert! I picked this 4-minute video because it showed off the AWESOME lighting and I did a better job on videotaping this one. You get a sense of the concert by watching it. The sights and sounds are absolutely amazing! Lastly, I am sharing some exiting news about the mental health campaign that my daughter Stephanie co-founded with two classmates from her Master's program back in 2012. It was announced yesterday that Stand Up to Stigma has been selected as a TOP 10 FINALIST in the Council of Ontario Universities' Mental Health 2.0 social media contest! If chosen to be top three finalists for this contest (to win up to $1,500), the popularity prize would go a long way to helping these students further their initiative. On behalf of my daughter Stephanie and the Stand Up to Stigma team, thank you in advance for the support! Happy Monday! It's my turn to share a Fresh Squeezed Stamps project with you. It's a super simple, super CAS card. 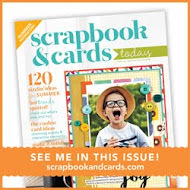 For more details about this card, please visit Fresh Squeezed Stamps. I would really appreciate it if you can leave some blog love there. The comment feature in this post has been turn off. Hello, my friends! 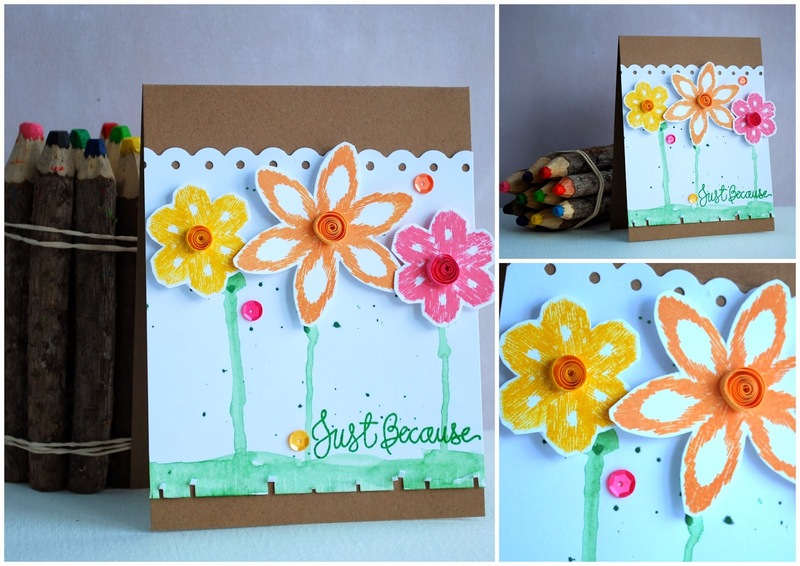 It brings me great joy to share some projects that I made for CAS-ual Fridays Stamps blog! Edited--> Special feature: Funky Square Tag Fri-Dies and Heart Board Fri-Dies Special features: with the Fir-dies, these decorations were very easy to assemble. I used gold strings to string up the die cut. It's a great kids project! There is a Blue Challenge going on over CAS-ual Fridays Stamps . It would be awesome if you can join the fun with us! I will share a video from Elton John's concert with you soon! Thanks so much for stopping by! 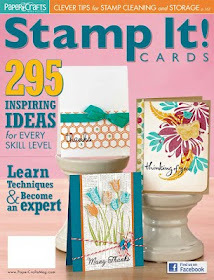 The Blue Challenge from CAS-ual Fridays Stamps! CASE Study #176 ( ...and my hot mess)!